Give this recipe a go from one of the finalists on Channel 9’s Hit Show – The Hot Plate! 1. For the Beetroot Jam, heat a heavy based, medium frypan or saucepan. Add vegetable oil, onion and ginger and sauté on medium heat until soft. 2. Peel and grate the beetroot, then add to the pan. Stir to combine. 3. Add sugar, vinegar and clove powder and stir to combine. Slowly cook on low heat (use a simmer mat if available) until the mixture is reduced and jammy – about 1.5hrs. If mixture becomes too dry and sticky before cook time has finished, add ¼ cup water and stir to loosen the mix. Continue to cook for remainder of time. Once cooked, set aside until required. 4. For the Sweet Potato Mash, preheat oven to 180 degrees. 5. Roast the sweet potatoes on a lined baking tray with skin on until soft – about 1 hour. 6. Meanwhile, add cream and butter to a small saucepan over medium heat. When butter has melted, simmer gently for 5 minutes. 7. Peel open the sweet potatoes on the baking tray, scoop out the flesh and pass through a potato ricer or mouli. 8. Add the cream and butter mixture and stir thoroughly to combine. 9. Add salt and pepper to taste. Set aside and keep warm until required. 10. 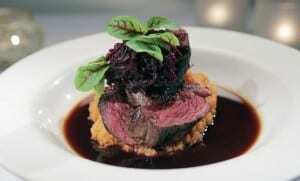 For the Jus, trim the kangaroo steaks of all fat, silver skin and sinew. Trim steaks to equal size portions. Reserve all trimmings. 11. Heat a heavy based saucepan over high heat. Add oil and kangaroo trimmings, toss quickly to colour and seal. 12. Reduce heat to low, add butter, shallots and garlic and sauté in the butter until golden brown. 13. Deglaze the pan with the wine. 14. Add the veal stock and simmer gently for 30 – 40 minutes, or until jus is reduced and slightly thick. 15. Strain through a fine sieve and keep warm until required. 16. For the kangaroo, coat with the vegetable oil and season with salt and pepper. 17. Grill on a hot barbecue until rare – about 3 minutes on each side. Rest for 5 minutes covered in a warm place. 18. In a bowl, toss the rocket leaves with the extra virgin olive oil, salt and pepper to taste. 19. To serve, place a spoonful of sweet potato mash on each plate. Top with a few dressed rocket leaves. 20. Cut each kangaroo steak in to several slices and place sliced steak on top of the rocket. Top with a dessertspoon of beetroot jam. 21. Drizzle warm jus over the top and around the plate.